Notes about photos, starting with the top left. In this picture of Christmas of 2008 you can see how the church looked like with old pews and before the remodeling. 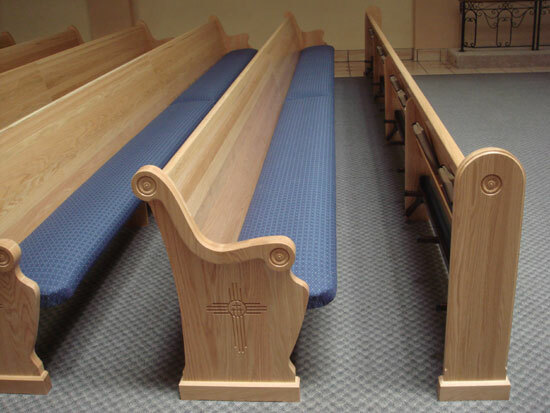 These pews served for about 15 years, and they really needed to retire. St. Genevieve Church with no pews and clean carpet. Temporary chapel in the conference room for the daily Mass. A team of employees and volunteers ensemble the pews. Father Ricardo Bauza is grabbing a pew end. An employee of Ratigan-Schottler teaches us how to ensemble. Process of assembling with volunteers. The new pews are assembled and attached to the floor. New look for the church, and a job well done. The design in the pew end is “zia” and a cross.